Northern Arizona University. Cline Library. Digital surrogates are the property of the repository. 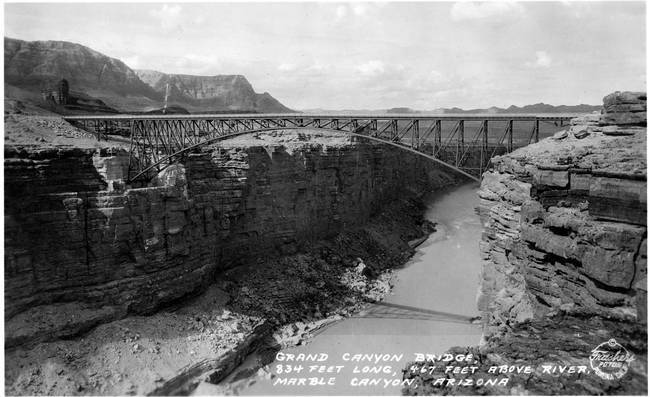 Reproduction requires permission, please contact special.collections@nau.edu. Digitized by: Northern Arizona University. Cline Library. Scanned by Northern Arizona University. Cline Library using Epson Expression 10000XL scanner, display file is JPEG. 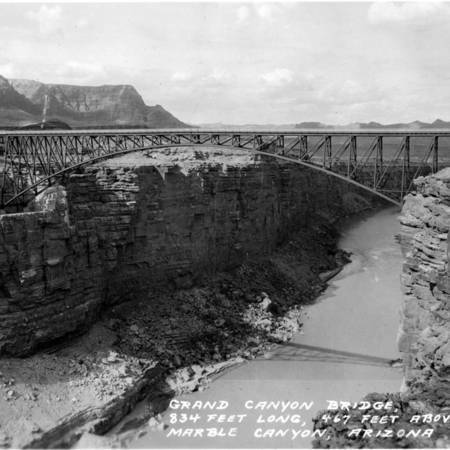 Frasher's Fotos (Pomona, CA);, “Grand Canyon Bridge, 834 Feet long, 467 feet above river, Marble Canyon, Arizona,” Highway 89, accessed April 25, 2019, http://highway89.org/items/show/706.